Let me just start this post by saying that I loved our wedding and probably wouldn't actually change anything because it was totally us at the time. But if I were to be getting married now (to the same groom of course), I would do things a little differently. 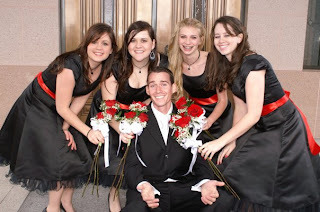 I was young (20) and had never been in a wedding before I was in my own! Obviously, I didn't know a lot. Oh, and we planned the wedding in less than two months! The dress. As a typical modest bride, I needed something that covered up the front, the back, the shoulders, and everything else! So, that pretty much narrows it down to big and lots of coverage. But that's okay because I wanted the Cinderella type of dress. I also love the beading (that you can't see in the pictures...) but right now, I like the more form fitting dresses. The flowers. I actually wouldn't change my flowers! I loved my bouquet. 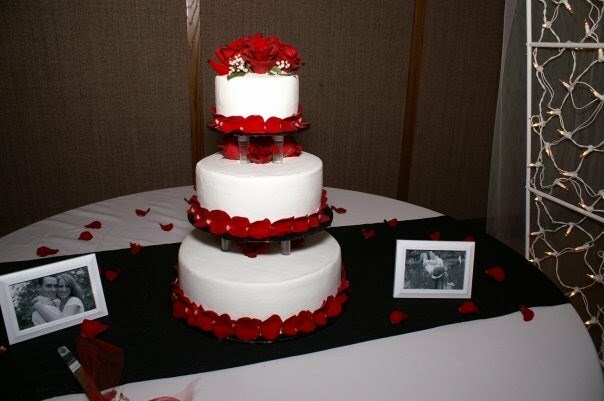 I didn't want it to be all one big blob of red, so I had them stick white flowers between the red roses. Our colors were just black and white with red accents. I was the white (dress), he was the black (suit), and we had red flowers. Our bridemaids wore black dresses with red ribbons and red flowers. The groomsmen had black suits and red flowers as well. My hair. My hair was up, which was good since it was windy outside and I didn't have to worry about it getting messed up or falling flat. 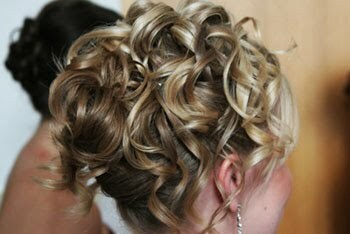 However...to me it looked more like an updo for a prom or something. It was pretty, and I like it, but not necessarily for a wedding. I also don't like how you can't even see my hair in most of my pictures. ...may have been more appropriate. It also would have been pretty to have a red flower in my hair! My makeup. It's something I feel like could have been more special. This was like an everyday kind of look I had on my wedding day. If I had been wearing even a little bit of lipstick (red, maybe?) it would have been a lot better in my opinion! The music. We asked for a bunch of Michael Buble to be played and other things that were light and lovely. But I think if we had had more time to pick out what kind of music to play, we would have picked more songs that are jazzy or from the piano. We also would have picked a shorter version of the song we danced to for our first dance. Even though we didn't really like the music, we loved our DJ! He has been friends with both of us for many years and he gave us a good deal! I loved our cake! At least I still love that, haha. I knew exactly what I wanted. We even saved the top of the cake and ate it a year later. It was still delicious! We were nice to each other as we fed each other the cake. That's a good sign! This post was brought to you by Mama Kat's Writer's Workshop! It's been a while since I have participated but this was something I have been thinking about anyway so it called out to me! I planned my wedding in 2 weeks and I am overall happy with how it went as well!! Weddings can be stressful when you plan them for years! I love your wedding theme, from your dress to your bridesmaids black dresses with red ribbons and flowers to the cake! Michael Buble is awesome too! Your wedding seems beautiful! :) I loved my wedding as well, but I would have changed my hair too. Unfortunately my hair is temperemental and curly, so having it the way I did was the only way to guarantee it would stay the same all evening. Oh well. Quite a great looking wedding for such a short preparation time. I think if I did things over I would somehow have the cake topper hid (the hotel decided to serve it since it was so delicious). 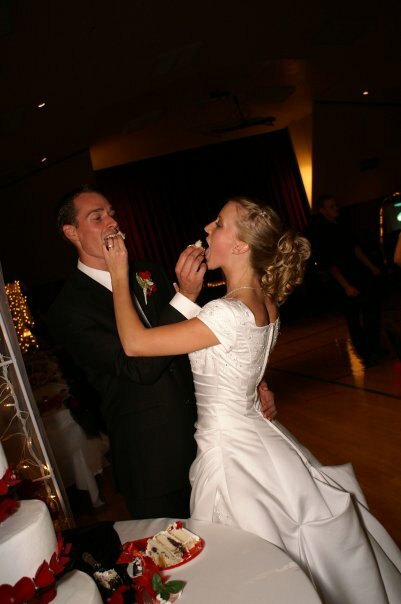 I ate the top of our wedding cake a year later too as is tradition and thought it was delicious. I hear so many couples throw it out! You were a gorgeous bride! I love your dress! Thanks for stopping my blog today and you were a stunning bride, by the way! Wow 2 months!? It took a year and a half to plan my wedding! Thank you so much for stopping by my site. My wedding took place two years ago in this coming October and my wish is that I would have let people help me. I am a control freak and a penny pincher which left me wanting to pull out my own hair. Well, I love your colors and your flowers are AMAZING!! i love everything about temple weddings :) you were a beautiful bride. And I loved you flowers and your colors. Go you for planning a wedding in 2 months!! Haha, this is really funny to me because I pretty much feel the EXACT same way as you! I loved my wedding, but if I could change a couple things, it would be the dress and my hair!!! I loved my dress then (Cinderella like yours) but in some pictures I feel like one side looked funny. And my hair I'd have done looser, maybe down and curly. Anyways, thought it was too funny how alike we are in that respect! Wow, you were such a beautiful bride. When I first saw the photos I couldn't think of a way you could have been prettier. I do like your choices for hair though once you pointed it out. What a lovely day though! love your flowers!! they kinda remind me of mine! i feel like i would have picked a totally different dress if i did it all over again. i liked mine, but i think i would go big and poofy instead of simple..
YOU were such a beautiful bride. The first picture is my favorite. You look SOOOOO happy! 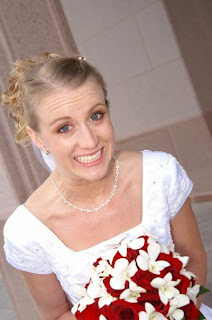 We're planning our June 19, 2011, wedding, which is why I started blogging. There's SO MUCH to think about! YOu were a beautiful bride and it looks like you enjoyed your day!